The Adventures of Pete & Pete is an American comedy television series created by Will McRobb and Chris Viscardi for Nickelodeon. It centers around two brothers, both named Pete Wrigley, and their humorous and surreal adventures in suburbia among their equally eccentric friends, enemies, and neighbors. The Adventures of Pete & Pete began on Nickelodeon in 1989 as minute-long shorts that aired as interstitials. Owing to the popularity of the shorts, five half-hour specials were made, followed by a regular half-hour series that ran for three seasons from 1993 to 1996. Reruns of the shorts and the shows now run on TeenNick as part of their block NickSplat on October 5, 2015. Jason Ankeny of AllMusic called the series "the greatest children's show ever", while IGN called it "one of the most well-written kids shows ever". The first two seasons were released on DVD in 2005; the third was planned for 2006 but was indefinitely postponed. Pete & Pete is set in the town of Wellsville (it is implied, but never explicitly mentioned, to be a fictionalized version of the real-life town of Wellsville, New York, as well as a nod to The Embarrassment's song "Wellsville"). License plates in the show refer to "The Sideburn State." An allusion to its location comes during "When Petes Collide", when the Petes' father runs four hours to the Canadian border to get rid of his bowling ball, Rolling Thunder. Certain parts of Wellsville were fictionalized for the purposes of the show; Glurt County, mentioned in "Yellow Fever" and "The Good, the Bad and the Lucky", does not exist in any state. The show was filmed largely in South Orange, New Jersey, with location shots done in a variety of other spots around northern New Jersey, including the Willowbrook Mall in Wayne, New Jersey. The exteriors of Pete & Pete's house (as seen in the credit sequence and other shots) were filmed on Melrose Place in South Orange, New Jersey. The football field used for various episodes is that of Bayonne High School in Bayonne, New Jersey. The fictional Wellsville High School's mascot is a squid. Danny Tamberelli (top) as Little Pete and Mike Maronna (bottom) as Big Pete. The show's narrator, Big Pete often acts as a voice of reason in contrast to the strange occurrences and people around him. Aside from typical sibling rivalry, he and his brother are best friends. He plays trombone in the school marching band. Big Pete's nemeses are "Endless" Mike Hellstrom and Open Face. Four years younger than his brother, Little Pete is often engaged in struggles against adults and other authority figures. He is also known to make irrational decisions in response to problems, like selling the house because his brother hung out with a girl instead of him, without taking responsibility for it (the only exception was back in 'Grounded for Life'). Little Pete has made enemies: mainly Papercut (whom he defied by throwing scissors, instead of rock), Pit Stain (for insulting his glandular disorder) and Mr. Schwinger (the principal of his school). Little Pete's primary nemeses are Hat Head and lifeguard Mike "The Urinator" Uplinger. A tattoo on Little Pete's forearm depicting a prone woman in a red dress, Petunia receives her own credit in the show's opening sequence. Little Pete likes to make Petunia "dance" by flexing his forearm. In the series, Petunia's origins are a mystery and a cause of bafflement for Big Pete, though in an early Pete and Pete short, it is explained that Little Pete originally got the tattoo as a Mother's Day gift. Little Pete has a second tattoo of a sailing ship on his back, although the origins of this tattoo are never explained. The Petes' mother, usually just called "Mom". Joyce has a metal plate in her head due to a childhood accident, with which she can occasionally receive radio signals. She tends to be the more stern parent and conventional parent, but also tends to be more reasonable than her husband, agreeing to compromise with her sons when the need arises. She also tends to intervene when her husband goes too far. The plate in Mom's head, which, like Petunia, gets its own opening credit. It can pick up radio stations, and, in the case of little Pete's radio station WART, can also broadcast them. Usually known as "Dad", Don is the Petes' father. He and Joyce met when the metal detector he was using on a beach led him to the metal plate in her head. He is extremely competitive against practically everyone, including his own sons (particularly Little Pete, who seems to have gotten his own stubborn streak from his father), his neighbors, and other local parents. His hobbies include obsessive lawn care and fishing, particularly for "Old Bob", a legendary striped bass. Ellen is Big Pete's best friend; though romance develops between the two on rare occasions, Pete generally sees Ellen as "a girl and a friend, but not a girlfriend". Over the course of the show she demonstrates some obsessive tendencies. In the pre-season 1 short "The Dot", as well as the season one episode "Day of the Dot" she is assigned the position of the letter "I" in "Squids" as part of the school marching band and attempts to hypnotize herself into "perfect dot-ness". She played French horn in the band. Ellen is also a huge fan of Greco-Roman wrestling, and has vast knowledge on the subject as seen in the episode "Pinned" where she tries to coach Big Pete. Little Pete's personal superhero, he is very eccentric but displays strange superpowers (he can skip stones on Neptune, move an entire house by an inch, turn Hat Head into a jack-o-lantern, and hit a golf ball 300,003 yards). Artie is one of the few adults Little Pete seems to have any respect for. His catchphrase is "I am Artie — the strongest man ... in the world!" His trademark word "pipe!" aggravates the adults of the community, and his favorite scent is the air let out of a car tire. He left the show after the 2-part episode "Farewell, My Little Viking". His spot in the opening credits would later be replaced in the third season with Nona. Teddy is one of Big Pete's three friends (the others being Ellen and Bill). Teddy is a perpetually cheerful dork who is also in marching band and is known for bringing up odd trivia, then remarking "what, you guys didn't know that?" He also loves to exclaim "Excelente!" while raising his finger and give "soul shakes" (an elaborate handshake punctuated by hissing "Soul!") to friends. Teddy's cheerful personality once drove Endless Mike to a complete emotional breakdown. Bill is Big Pete's friend, who has a knack for practical jokes and sarcasm. He was renowned for getting Teddy to shoot milk out of his ears and getting Bus Driver Stu accused of kidnapping a busload of kids. He also admitted to once eating snot in the episode "Field of Pete". Bill did not appear after the second season. Little Pete's best friend. Her middle initial "F" stands for Frances, but she wants to change it to Frank, Fahrvergnügen, or Forklift. She wears a cast, not because she has a broken arm but because it causes an annoying, itchy feeling on her arm which she enjoys scratching. She had a brief crush on Little Pete once or twice in the series. A neighborhood kid and Little Pete's friend. She stays awake by pulling her pigtails. One of Little Pete's friends, Monica is the resident Kreb Scout. Her unfortunate luck with pets has given her a reputation as the "Girl Scout of Death," and she even has a graveyard for them. She has excellent hearing, supposedly because one of her ancestors married a bloodhound. Also known as "Wayne the Pain". First appearing in the third season, Wayne tended to tag along with Little Pete and his friends, but as his nickname implied, Little Pete found him annoying due to his cluelessness and his tendency to spout phrases like "geez louise!" Wayne had an unrequited crush on Monica, who found him as irritating as everyone else.. 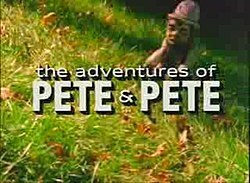 He was in several episodes as a friend of Little Pete. He served as the drummer of Little Pete's band, The Blowholes, and was a member of the Nightcrawlers, staying awake longer than anyone other than Little Pete and Artie. Appeared in the "Nightcrawlers" and "The Call" episodes as a friend of Little Pete. Libby was adopted by the Hurley family. She stays awake via Solar-powered sneezes, but flagged once the sun went down. Endless Mike is the mortal enemy of Big Pete. The origins of his nickname are unknown, though it is speculated it was due to his perpetually repeating the same year of high school; it has also been stated that his nickname comes from the fact that "his hatred of Big Pete is endless". Endless Mike reigns over shop class and loves Neapolitan ice cream. Although his relationship with Big Pete is largely antagonistic, the two have joined forces on rare occasions. The neighborhood kids hate and despise Endless Mike, but also envy him because he owns his own car. Hat Head draws his name from the fact that his hair perpetually looks as if it has been flattened by a hat, even though he is never actually seen wearing a hat. He originally appeared on several of the original shorts, making him the first bully in the Pete and Pete world. Hat Head hates Halloween and plots with Endless Mike to ruin it for the neighborhood kids, in part because Halloween is too frightening for him. He is frequently defeated by Artie, who protects Little Pete from him. One of Big Pete's enemies. A boy who is always shown eating open-faced sandwiches, even in church. Ellen dated him briefly in one episode. Little Pete's primary antagonist in season 3, he has a glandular disorder that gives him huge, smelly armpit stains. Little Pete gave him the nickname, which was quickly adopted by everyone in school (including the teachers), causing Pit Stain to swear revenge against Little Pete. He has a secret crush on Nona which often distracts him to the point of abandoning his pursuit of Little Pete. He is also often seen with his goons, "Hairnet" (Helen Davidson) and "Drawstring" (Yull Neri Borda). Drawstring was later replaced by "Nightbrace" (Robert Whitfield). During episode 3.07, "The Last Laugh", Little Pete and Pit Stain worked together to mastermind a prank on Principal Schwinger and the "Up With Personal Hygiene Singers." Little Pete's enemy in the season 2 episode "Farewell, My Little Viking" (parts 1 and 2), where he originally was Artie's enemy before refocusing on Little Pete. A boy who grew up in a copy shop, he is covered with lacerations and scars from paper cuts. Paper Cut can fold paper into hundreds of origami shapes, including makeshift weapons. Paper Cut enjoyed making life miserable for the helpless students by forcing them to throw "rock" while playing Rock–Paper–Scissors (since he always throws "paper"). However Little Pete defied him by throwing "scissors." Paper Cut made it his personal mission to destroy Little Pete in the rematch. Little Pete repeatedly defies him, and finally the students gang up and drive Paper Cut out of Wellsville forever. The principal of Little Pete's school, Schwinger loathes Little Pete and always tries to stop his pranks, to no avail. He has a strange love of personal hygiene, to the point that he manages a group of folk singers called the "Up With Personal Hygiene Singers," who attempt to enforce ridiculous strict standards of cleanliness on the entire student body, through song. Schwinger also orders the students to mandatory squat thrust exercises and feeds them cafeteria lunches of nothing but creamed corn, Schwinger's favorite food. Fed up, Little Pete makes a truce with his mortal enemy Pit Stain to orchestrate a prank that ruins Schwinger's reputation and frees the school from his control. The lifeguard at the Wellsville swimming pool, he appears in ("Splashdown") as an antagonist to both Petes. When Little Pete and his friends threaten adult swim with their "atomic splash," Uplinger conspires to undermine them by giving Big Pete a lifeguard whistle and power over the pool. Big Pete is won over by his new authority and tries to do a good job by enforcing the pool rules, including kicking his brother and friends out of the pool. However, Big Pete realizes that Uplinger has been using him and soon joins Little Pete in defying Uplinger by performing the Atomic Splash, causing even the adults to join them in the forbidden dive. Uplinger is finally defeated and driven away after he is exposed as having broken the primary pool rule: never urinate in the pool. Ellen's father and guidance counselor of Big Pete's high school. Once an enemy of Don Wrigley. Nona's loving and occasionally overprotective dad. One of the many adults who feared Artie due to his strange ways until Artie stood up for him against his mortal enemy, John McFlemp. He is very proud of his home and his neighborhood. After the Pumpkin Eater gang was exposed, Mr. Mecklenberg forced the gang to clean the entire neighborhood with cotton swabs. A parody of Mister Softee, Mr. Tastee is a mysterious ice cream vendor who never removes his mascot costume head. Mr. Tastee comes to symbolizes summer for the neighborhood kids, who become caught up in the mystery of who he is and why he seems so lonely. When the Petes' attempts to strike up a friendship causes Tastee to flee, the Petes and Ellen spend the summer tracking him down, learning that he was once married to a blind millionaire who called him "Leonard." The kids eventually find Mr. Tastee, who confesses that he has commitment issues. They agree to allow Mr. Tastee his privacy as long as he returns to the neighborhood. An eccentric and emotionally unstable bus driver who was once in love with fellow bus driver Sally Knorp. His longing for Knorp causes him to drive his charges in endless loops through town, pointing out significant locations in his and Sally's relationship, while the children are forced to listen in frustration. Finally Endless Mike comes to the trapped kids' rescue by reporting Stu for kidnapping, while Ellen and Big Pete arrange a reconciliation with Sally. Stu does play protector to Little Pete in the season 2 finale episode "Sick Day" when he helps him avoid getting caught skipping school, and in the season 3 episode "The Good, The Bad and the Lucky", where he puts Pit Stain and his gang under bus arrest. A crossing guard who defends the crosswalk with his life, abiding by "the code of the crosswalk." Frank is haunted by the memory of the time he failed to save Little Pete's pet lizard Gary from death by oncoming traffic. Despite this, Gulcher is one of the few adults who Little Pete is friends with. Martin Donovan — Crossing guard Kenneth G. Keegan who passes messages between Big Pete and Ellen in "Apocalypse Pete"; also Smith ("Smitty"), a security guard whom Little Pete and Petunia distract in "Space, Geeks, and Johnny Unitas." Miracle Legion — The four-piece version of Polaris that Little Pete sees in a garage ("A Hard Day's Pete"). Polaris, in turn, was Miracle Legion minus guitarist Mr. Ray. Vincent Pastore — Vincent Park, a neighbor and bowling agent who is impressed with Artie's bowling skills and gets him to sign a bowling contract. Liza Weil — Margie Corsell, a girl for whom Big Pete abandons his brother ("35 Hours"). Weil also played a bully in "Yellow Fever", with her mother Lisa as a teacher in the same episode. One widely reported guest appearance — Hunter S. Thompson in "New Year's Pete" — has been described as "apocryphal" by show creator Will McRobb, who has said the Hunter Thompson listed in the credits is instead a similarly named extra. The show featured music by such artists as Luscious Jackson, Nice, Drop Nineteens, Racecar, Chug, Poi Dog Pondering, Syd Straw and The Apples in Stereo. The music of Stephin Merritt can also be heard throughout the series, including songs from his projects The Magnetic Fields, The 6ths and The Gothic Archies. On the DVD commentaries, the director and the creators revealed that they tried to use a song by the Pixies, but could not afford the rights. Polaris, a side project of Mark Mulcahy's Miracle Legion, served as the show's "house band", providing the theme song and many other tunes heard throughout the series and even appearing in "Hard Day's Pete" as a local four-piece playing out of a garage. Some of the Polaris' music from the show was released as a CD, Music from The Adventures of Pete & Pete, including the theme song "Hey Sandy". With a total of 2100 pressings, the album sold out promptly and was considered a must-own by many reputable collector sites, such as Modern Vinyl, Consequence of Sound, and Paste Magazine. Music from the show was also available in 1995 on a promotional cassette mini album, titled Happily Deranged, available by sending in UPC symbols from Kellogg's Frosted Mini-Wheats. This cassette includes the Polaris songs "Hey Sandy," "She is Staggering" (listed on the cassette as "Staggering"), and "Coronado II". The cassette includes a short introduction and closing read by Big Pete. Robert Agnello was the writer and creator of numerous pieces of music for Pete and Pete and wrote the Blowholes music for the "Hard Day's Pete" episode. The show runners originally intended to use the song "Mississippi Queen" by Mountain for the episode, but could not afford the song rights and instead asked Agnello to write a "sound-alike" version. Agnello's sound-alike song, "Marmalade Cream," was so catchy that he was asked to produce three other songs for the episode: "Summer Wind," "Piledriver," and "You Color My World." He also wrote "One Lousy" Dance which was sung by Iggy Pop and the Garbageman theme sung by David Johanson. Many incidental songs in the series were performed by Agnello and his band Lamb to Slaughter. The show also used music from standard production music libraries. "Ballata Per Un Pistolero (Ballad of a Gunman)" A notable Western theme in the style of Ennio Morricone, it was used whenever there was a showdown between characters, for example Little Pete and the ringing phone in "The Call". Nickelodeon VHS tapes were first released through Sony Wonder, then through Paramount. "Snick Vol. 1: Nick Snicks Friendship" — Includes one episode from each show in the early SNICK lineup: Clarissa Explains It All, Roundhouse, The Ren & Stimpy Show, and Are You Afraid of the Dark?. A pre-series Pete and Pete short is included in between each show. This tape includes the shorts "Artie, the Strongest Man in the World", "X-Ray Man", and "Route 34". "Snick Vol. 2: Nick Snicks the Family" — Includes the same lineup as "Friendship". The Pete and Pete shorts are "The Burping Room", "Mom's Plate", and "The Punishment". "School Dazed" — Includes the episodes "Day of the Dot" and "Tool and Die", plus the bonus short "StareMaster" (with an accompanying "Magic Motion Eyeball Card"). "Farewell, My Little Viking" — Includes both parts of the story, edited into one long episode. Also includes the short "Artie, the Strongest Man in the World". Nickelodeon DVDs are released through Paramount. Season 1 May 17, 2005 All 8 from season one "Valentine's Day Massacre"
"New Year's Pete" "What We Did on Our Summer Vacation"
Season 2 November 1, 2005 All 13 from season two "Space, Geeks and Johnny Unitas" "Halloweenie"
According to co-creators Will McRobb and Chris Viscardi the season three DVDs were actually pressed and are sitting in a warehouse. In a LA Times article they discussed the situation. McRobb said, " The same thing goes on with the mythical third season on DVD. They put out the first two and everyone's thrilled, and the third one doesn't come out, and no one has ever told us why. And they made it, it's in the warehouse.". Viscardi added, "It's packaged, it's recorded, we did commentary tracks with a bunch of the cast, there's all these special extras on it. They pressed them, we saw it. Nothing." The Adventures of Pete and Pete first-ran on Nickelodeon from 1993 to 1996. Reruns continued to air from 1996 to 1999, and again from 2003 to 2004 on U-Pick Live. It also aired reruns on The N from 2002 to 2003. The Adventures of Pete & Pete was one of the series mentioned as a potential future series that would air on The '90s Are All That; Despite images of the show appearing in the often-shown The '90s Are All That commercial promos, no episodes of the series have aired on the block. The 1989 shorts began airing on the block in 2013. When the block expanded into The Splat (now NickSplat) in 2015, Pete & Pete was listed as part of the block's lineup, but had yet to be scheduled (only the shorts have been aired on the block). On May 28, 2017, it was announced that Mike Maronna and Danny Tamberelli would take part in a weekend-long event on NickSplat called "The Adventures of Pete & Pete: The Strongest Reunion in the World" on June 17 & 18, where classic episodes were replayed while they share various moments from making the series. In late 2011 and early 2012 a series of cast and crew reunions took place in Los Angeles and New York City respectively. Tamberelli, Syd Straw and Marshall Crenshaw performed a rendition of theme song "Hey Sandy" in addition to other Pete and Pete compositions. Creators McRobb, Viscardi, along with Michael Maronna, Hardy Rawls, Judy Grafe, Alison Fanelli, Toby Huss and Director Katherine Dieckmann were all in attendance. The 2011 Los Angeles reunion was billed by the Cinefamily as the "KrebStar Film Festival," a reference to the show's own brand. Additionally many products from the show were available, including Krebex, Kreb Scouts, KrebStore 24 and Krebgate Toothpaste. Staff members also handed out "performance-enhanced" Orange Lazarus. Since September 2013 Danny Tamberelli and Mike Maronna release a monthly podcast "The adventures of Danny and Mike". ^ Appelstein, Mike. "Going Back To Wellsville: Six Great Musical Moments From The Adventures Of Pete & Pete". www.villagevoice.com. The Village Voice. Retrieved 29 January 2019. ^ Adventures of Pete and Pete, The – Short 15 – "The Dot"
^ Adventures of Pete and Pete, Season One – "Day of the Dot"
^ Adventures of Pete and Pete episode "Pinned"
^ Bradley, Paul T. (August 29, 2012). "Adventures of Pete and Pete Cast Reunites Again (With the Band Polaris!)". LA Weekly. ^ Bradley, Paul T. (November 21, 2011). "The Adventures of Pete and Pete Reunion at Cinefamily: Mike Maronna, Danny Tamberelli & Artie...the Strongest Man...in the World". LA Weekly. Overview of Pete & Pete music, including lyrics of theme song "Hey Sandy"